Nokia Lumia 1020 (Quick Review) has now been officially launched in India and will be available for purchase starting from 11th October 2013 . This phone will be remembered as the best thing to come out of Nokia-Microsoft partnership, who worked with close cooperation to manufacturer this beautiful build quality phone with a whooping 41 MP camera. This phone will be available for purchase starting from 11th October 2013. Two accessories, Nokia camera Grip and Wireless charging jacket will be available for Rs 7,500 and Rs. 3,200 respectively. Nokia will reveal the price one day before the phone will be made available that is on 10th October 2013. 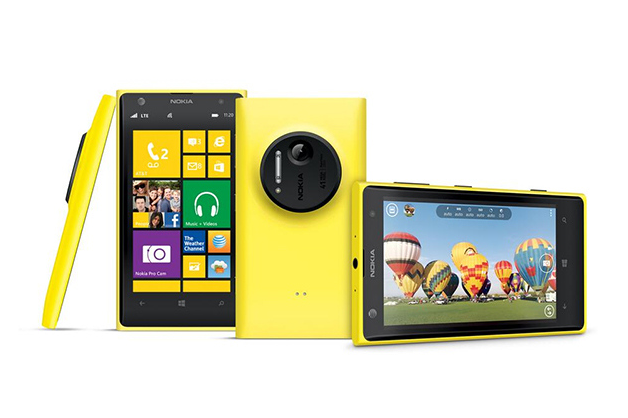 Most highlighted feature of Nokia Lumia 1020 is its 41 MP PureView camera which Nokia claims is much more than MP count. The camera features advanced Optical Image Stabilization where entire lens assembly moves to provide vibration offset, stack of 6 Carl Zeiss high end lenses along with Xenon and LED flash. This Phone is also equipped with Nokia Pro Cam App which will provide you with a very professional and easy to use Camera UI. Users can attain 4 X Loss less Zoom without losing any details while shooting 1080p videos. This camera comes with a unique dual capture feature where by 7 pixels around each pixel are used to oversample the pixel with additional data to ensure sharper and more natural image with minimum noise. This 5 MP over sampled image is easy to share across the internet and can be printed on a A3 page with astonishing details. 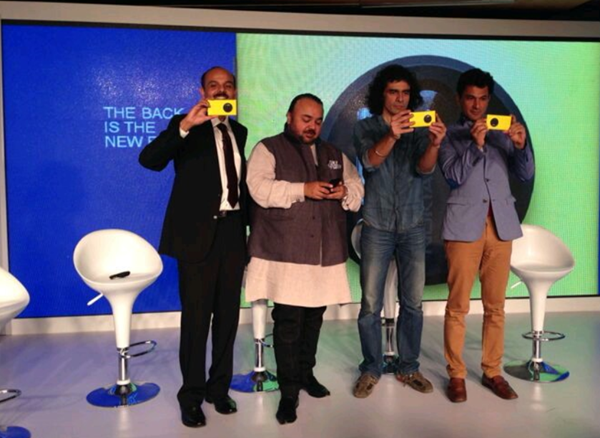 Nokia will also provide with a camera grip accessory with extra battery for Rs 7,500 for easy clicking of pics. 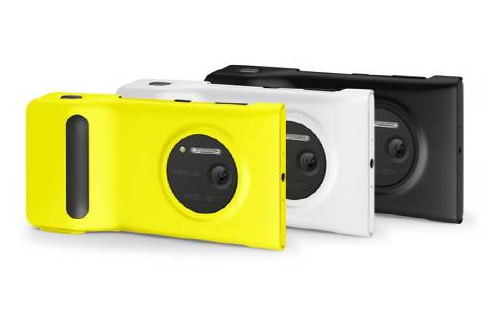 You can read the detailed working of this camera on our blog post “The fascinating Nokia Lumia 1020 camera”. A front camera of 1.2 MP is also present for Video calling. This phone features a 4.5 Inch AMOLED PureMotion HD+ display with Nokia’s signature ClearBlack technology which reduces the reflected light using polarizing filters to give you better outdoor visibility. This display has 768 x 1280 pixel resolution which will amount to 332 ppi and thus give you a sharp and clear display. This display is further protected by Corning Gorilla Glass 3. This phone is powered by a Qualcomm MSM8960 Snapdragon Dual core processor clocked at a frequency of 1.5 GHz. The GPU employed is Adreno 225. This processor coupled with 2 GB of RAM would give you smooth performance. The internal storage is 32 GB and is not expandable. This phone will have Windows Phone 8 operating system which is upgradeable to WP8 Amber. The battery capacity is 2000 mAh and will provide you with ample 19 hrs of talk time on 3G and 13 hrs 20 mins on 3G.This battery can be wirelessly charged using the Wireless jacket accessory for Rs. 3,200. Connectivity features include GPRS,EDGE, HSDPA -42.2 Mbps, HSUPA- 5.76 Mbps, WiFi, DLNA, NFC, microUSB , GPS with A-GPS support and GLONASS. This phone will compete with phones like Samsung Galaxy Note 3, LG G2 and Sony Xperia Z1. The camera enthusiasts will buy this phone in a heartbeat, putting aside the shortcomings of the Windows operating system. This phone seems like a worthy successor of Nokia PureView 808. The camera grip at 7,500 and Wireless charging jacket at 3,200 are priced a little steep. This phone will be available for purchase in Yellow, black and white colors starting from 11th October next month. You will also get 1 year of Complimentary Handset insurance plan from New India Assurance. Nokia has remained tight lipped on the price, citing fluctuating currency as the reason.